Would You Rather Know Sooner Or Later? I used to live in a house with a well. I tested it every year. I wanted to know the water was safe. I could have waited a few years between tests. I’d rather know I have a problem sooner than later. I see my doctor annually for a check-up. He runs tests for diseases he does not think I have. I’m OK with that. I’d rather know I have a problem sooner than later. Coal miners used to bring a canary in the mines with them. When the bird stopped singing it meant there could be deadly gas, and it was time to leave. Good to know there was a problem sooner than later. Banks depend on all kinds of risk management tools to avoid and mitigate potential problems. An insurance review should be part of that process. is a month before you have an uninsured loss. Having an unbiased bank insurance review is just good business. Regulators, stockholders, and stakeholders (as well as your boss) expect that you have made sure you have the right insurance coverage. The expectation is that you have no coverage gaps. Insurance overlaps are bad, too – you’re wasting resources. Without a comprehensive review of your bank insurance, how will you know you have a problem? Wouldn’t you like to know sooner than later? I work with small- and medium-sized banks all over the US. Each hires me for its own reasons. Most seem to have small doubts that grow over time about their insurance. Insurance questions put to your agent are not answered convincingly. There are doubts about the quality of your bank’s insurance. The bank’s insurance agent sits on the board, which is a potential conflict. The bank’s insurance agent is related to the CEO. The CEO/CFO/CRO want to be absolutely sure of coverage adequacy. Your agent does not work with many banks. The bank board wants an independent insurance review. It has been some time since anyone besides your agent has reviewed your bank’s insurance. You send me the policies you want me to review. I go over them (usually fortified with lots of coffee) and report my concerns to you. I put my thirty years of insurance experience to work for you. I use the knowledge I have gained from my reviews of insurance for over three hundred banks to improve your bank’s insurance coverage. You get access to my bank-insurance-brain. I’m told I talk about issues nobody else talks about. I’m told I make bank insurance understandable. What’s The Impact On Your Financials Of A $500,000 Uninsured Loss? What’s The Impact On Your Career? A review of your directors’ and officers’, management liability, employment practices, bankers professional, lender liability, cyber liability, and fiduciary liability. A review of your bank specialty policies – directors’ and officers’, management liability, employment practices, bankers professional, lender liability, cyber liability, fiduciary liability, and your financial institutions fraud-bond. 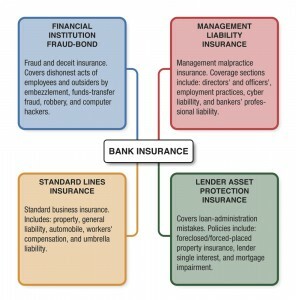 A review of your bank’s specialty insurance – directors’ and officers’, management liability, employment practices, bankers professional, lender liability, fiduciary liability, cyber liability, financial institutions fraud-bond, your property insurance, general liability, workers’ compensation, umbrella liability, and auto insurance. A review of your management liability, fraud-bond, standard lines, and your lender asset protection insurance – directors’ and officers’, management liability, employment practices, bankers professional, lender liability, fiduciary liability, cyber liability, financial institutions fraud-bond, your property insurance, general liability, workers’ compensation, umbrella liability, auto insurance, mortgage impairment, REO property, forced placed property, forced placed flood, and lender’s single interest. You send me your policies and a summary of current insurance (usually from your agent). You complete an exposure form that helps me uncover unusual risks your bank might have. We have a brief conversation about the process and your bank. In about two weeks I report my ideas, concerns, and recommended strategies to you. I point out the gaps and overlaps in your bank’s coverage. I give advice on the amount of coverage you buy and suggest areas where you should consider changes. My report is delivered in a conference call. You’re welcome to invite key officers, directors, or your entire board to the session. I present my findings, and we discuss options. Your team is free to ask questions, challenge me, and make suggestions. These free-flowing sessions last from ninety minutes to two hours. Your team can ask as many questions as they like. Insurance clarity is the objective. Frankly, the phone sessions are my favorite part of my job. Pragmatic, useful, valuable information is gained by your management. It’s in these sessions that the rubber meets the road. After the session you get a summary of the conversation and a listing of the suggested tactics. From there you decide how you want me to proceed. You can work with your agent or have me handle the mitigation conversations. I am available to help you in any way you need me. Let’s start with a phone call to discuss your bank’s current insurance concerns. Let’s talk to see if you need me. Let’s talk about what value I can bring to the table. Call me at 207-284-0085. I’ll answer the phone or get back to you in a few minutes. Call me. Of course, you can email me too (Scott@ScottSimmonds.com). How long until you get the coverage report to us? It depends on scheduling. I usually can get you on the calendar within two weeks of when I receive your policies. My practice is to schedule sessions as soon as I have been paid and have your policies. I understand that time is important. Also, claims can happen at any time. The sooner we ID an issue, the better. How Do We Get Our Insurance Policies To You? Many banks scan the policies and email them. You are free to mail a “hard-copy” copy if you like. If it is easier, use my secure download page to move files directly from your computer to mine. Will your review reduce our bank insurance premiums? Sometimes. Usually I find gaps in the insurance coverage or adjustments that need to be made – that can mean additional premium. Would you rather spend $1,000 in extra premium or have a $500,000 uninsured loss? Sometimes my recommended coverage additions can be negotiated at no additional premium. That’s where my expertise helps in the mitigation of the issues I find. Do you review our employee benefits and bank owned life insurance? No. These are specialty areas of insurance that frankly don’t interest me. To do benefits and life insurance takes a unique skill set that I am just not interested in acquiring. I’d rather be great at my part of the insurance business than mediocre at all types of insurance. Never. I don’t sell insurance. I don’t accept fees or commissions from insurance agents or insurance companies. I never accept gifts or gratuities from insurance agents or insurance companies. My only interest is the best interest of you, my client. Do you work in personal insurance? Rarely. Sometimes there is an individual question or issue. I’m glad to pitch in on that. After the first call, you make us talk with some assistant. Right? No. You call me, you get me. You email me, I respond. I return all phone messages within ninety minutes and emails within a business day. You hire me, you get me. I answer my own phone and respond to emails sent to me. What if I don’t know what questions to ask? I’m no insurance expert. In the review I provide a list of items that need to be addressed, and recommendations on how to address them. You work with your agent, and I am available to help. I can even talk with your agent if that will make things easier. We can set up a conference call to talk about the coverage concerns. How responsive are you to calls and emails? I promise a callback within ninety minutes and a reply to emails within a business day. Frankly, most times I answer my phone, since it allows me to deal with issues quickly. I have set up my practice to provide an exceptional level of service to my clients, and I want you to renew year after year. How do we know if you are any good? I’m glad to provide references. You can also look at my client testimonials. Our bank owns an insurance agency. Why should we hire you? Your bank-owned-agent probably does not work with many banks. I can offer special expertise and experience. I don’t take anything from your agent, but I supplement with specific and current bank insurance knowledge. Are you sure that your agents (as good as they probably are) have expertise in bank insurance? Will your outside board members be confident in the review your own people provide? Do we have to change insurance agents to work with you? Absolutely not. I’m not an insurance agent. Many community banks have a close relationship with their agents. These are important and often must be preserved. I understand the community bank business.